It's my two favorite writers in one book signing event! Chick-lit authors Marla Miniano and Ines Bautista-Yao will conduct back-to-back book signing sessions on January 26, Thursday, from 6:00 PM to 9:00 PM at Powerbooks, Greenbelt 4. 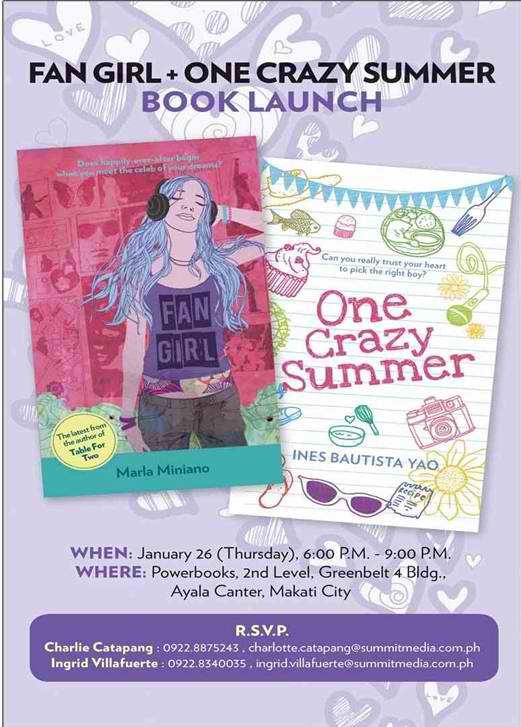 Summit Books released the novels Fan Girl by Miniano and One Crazy Summer by Yao last year. Miniano, author of the Every Girl’s Guide series and Table For Two, is now also Candy magazine’s deputy editor-in-chief. She is back to delight readers with her newest book where girl meets boy and girl falls for boy… together with half the world’s female population. Fan Girl tells the story of Summer as she takes a full-on adventure towards love, celebrity stalking, and chasing after the crush of her dreams, Scott Carlton, front man of the hot local band Violent Reaction. One Crazy Summer by Ines Bautista-Yao, a veteran writer under various magazines of Summit Media, chronicles Tania’s summer cooking adventure as she sets off to pursue a culinary career by taking her first internship at her aunt’s restaurant. But what happens when her career comes to a halt before it can even begin? Fans will get the chance to meet and greet the authors, as well as enjoy a book reading and a bit of entertainment. A question and answer portion will also be conducted before the mini-signing. Relive your kilig moments by grabbing your copy of Fan Girl and One Crazy Summer, available in Powerbooks and National Book Store branches nationwide for only P175 each.